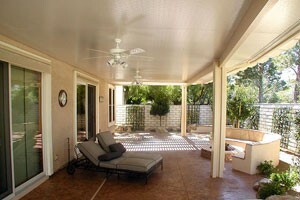 Ultra Patios is Las Vegas’ number one choice for insulated patio covers. We’ve been constructing patios for over 35 years and have a wealth of experience in fending off the Vegas heat with specially designed patio covers. With Ultra Patios, you also deal directly with the owner and avoid the hassle of working with middlemen. Insulated patio covers are like any other patio cover with the exception of a 3″ thick foam inclusion that is sandwiched between the aluminum material used to form the roof. The insulated construction still offers the same low-maintenance characteristics that are the hallmark of our standard Alumawood covers. They also come standard with a limited lifetime warranty that is better than the average patio cover warranty. Our Alumawood and Elitewood patio covers are embossed to resemble the natural beauty of cedar and real wood grain. This American-made aluminum product is weather resistant and built to last. By including a layer of 3″ thick foam between the embossed aluminum sheets, you will see an immediate difference. Not only will you reduce the heat radiating from the top of the patio cover, but you will also experience the relief of reducing the temperature by a solid 15 degrees. The loud pounding of rain will be softened to a pleasing patter, and you’ll be able to stand on the patio cover because of its increased stability. Seasonal cleaning just got easier and less time-consuming. Don’t subject yourself to the sweltering heat of Las Vegas summers when you can easily add an insulated patio cover to your home. Not only will you personally enjoy the benefits as you relax outside, but you’ll also find that your friends and family will reap the benefits too. Imagine being able to grill without the harsh sun or an unexpected rain shower. You can expand your usable outdoor space, and also add to your home’s overall value. Ultra Patios provides our customers with a complete turnkey patio cover that is built to last – and built to address your individual needs. Call us for a free in-home estimate and discover the insulated patio cover options that are available to complement your home and keep you cool.